I’ll be honest I can’t figure out why there is such a crossover of Christmas and Halloween films, but there is. When looking for films for the top Halloween films there is a disturbing number of horror movies that take place at Christmas and there is a bizarre number of Christmas stories with horror elements (think about it, the most famous Christmas story is the story of a guy being haunted by ghosts). I’m at a bit of a loss to explain why this is. However, the fact remains that there is this odd Venn diagram between Christmas and Halloween films, and as such I should probably admit it with at least one of the films on this list. And so we go to The Nightmare Before Christmas. Why this film? I mean, I personally only need to see it once a decade (if that). But it mainly gets on the list because it seems to be the most in line with the spirit of wonder and happiness. 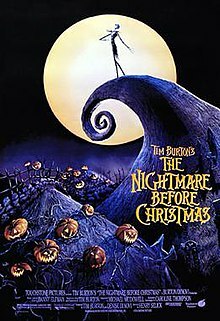 For all of its flaws (and I will understand perfectly if Burton’s love for unusual animation isn’t your thing) it seems to understand Christmas better than Halloween. Just the song “What’s This” when Jack discovers Christmas Town alone allows us to look at all the small parts of Christmas—the lights, the snow, the mistletoe, the food, which we may all do but only in a mechanical way, that’s the way we’ve always done it–with a new found wonder. It allows you to find the wonder of all those elements we have long since forgotten. And in some ways, and I realize I may be pushing it with this, but Jack’s problems with his own holiday of Halloween, finding it dull and repetitive and pointless is the problem many of us find as we grow up. We stop looking at all holidays (okay most of them, there was never wonder in the communist tripe that was Labor Day) with the wonder that they should have. And it’s utterly refreshing to see, how if we let it, the Christmas season can brighten even the darkest recesses of our lives. And, I think this ties into one of the more subtle themes of this story that Christmas offers us a chance to see the best in ourselves and what we like most about ourselves. Who we really are: the best and most lovable within us that make us happy with ourselves. Which is in part what Christmas is all about, a new beginning in life even if your life stays the same–a promise of new beginnings and wonder. And it this new found wonder at his own life that Jack finds because he discovered Christmas. That, more than any other reason is why this is a good Christmas film.